As noted earlier, the bond angle of the carbon atom in diamond is 109 degrees 28 minutes. With respect to the ball and spoke model, this means that each ball is symmetrically surrounded by four spokes that are displaced at 109° 28’ relative to each other. 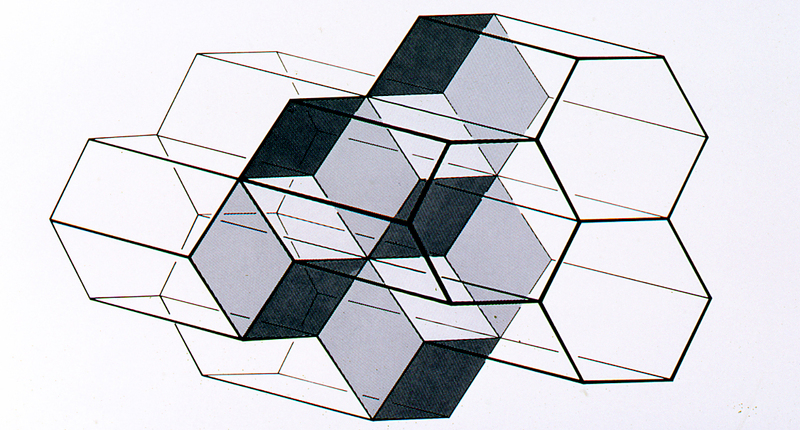 However, as noted above, when viewing the diamond crystal on an axis parallel to its spokes, a uniform hexagonal geometry is revealed. Note that equilateral triangles dominate this image. That is because the regular hexagon can be assembled form six equilateral triangles. As we mentioned early, the face angle of a regular hexagon is 120 degrees. Six triangles around a point adds to 120 degrees, since the interior angle of an equilateral triangle is 60 degrees (60 x 6 = 120). Both the regular hexagon and the equilateral triangle can repeat to fill the plane, as in floor tiling. These geometric patterns are pervasive in nature at various level of scale from patterns observable with the naked eye to patterns that can only be seen with highly magnified microscopic images. In nature these patterns comprise structures of energy conserving least energy. Perhaps the quintessential example of such patterns, which is easily seen with the unassisted eye, is the cellular structure of the honeybee. Here we see the uniform 120° hexagonal pattern constructed by the worker bees from beeswax. The bee’s honeycomb stores the greatest amount of honey with least amont of material. It is a pattern of least energy. 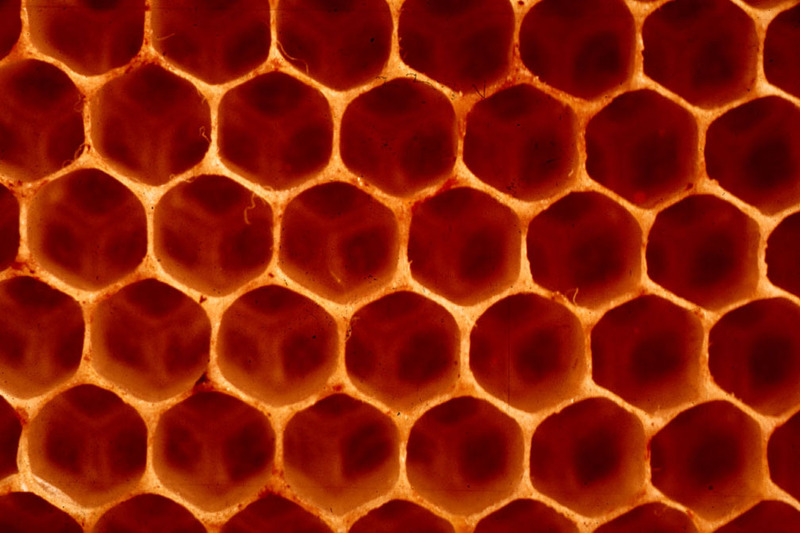 The bee’s honeycomb has two layers of cells, which are juxtaposed in opposite directions about a common plane. The two layers are offset with respect to each other. This offset can be seen in the photographs. The angle where they meet, seen at the center of the bottom of each cell is 109° 28’, the bond angle of carbon in the diamond crystal. There is another way to see the relationship between the repeating regular hexagon and the equilateral triangle. By connecting the centers of adjacent hexagons in a tiling, a pattern of equilateral triangles is the result. This relationship may be considered reciprocal. Similarly, by connecting the centers of adjacent triangles in a tiling, a pattern of repeating hexagons will be generated. 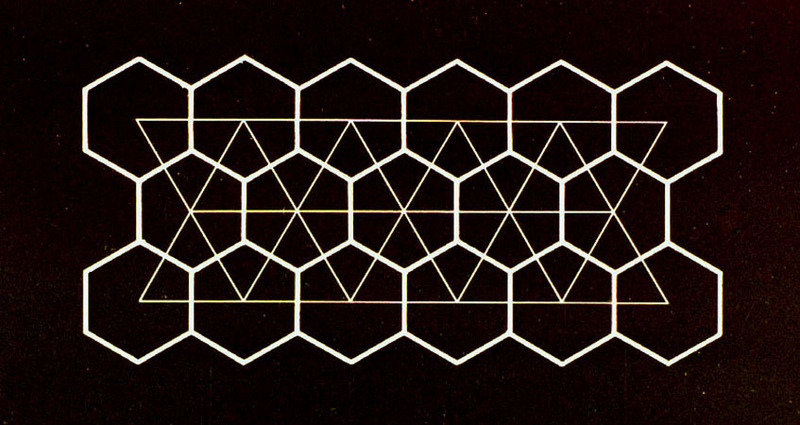 When hexagons morph into triangles by collapsing the corners of the hexagons a triangle pattern is created. This actually happens in nature. One example is when the corners of a three-dimensional array of plant cells collapse in the pith of Juncus, a wetlands grass. 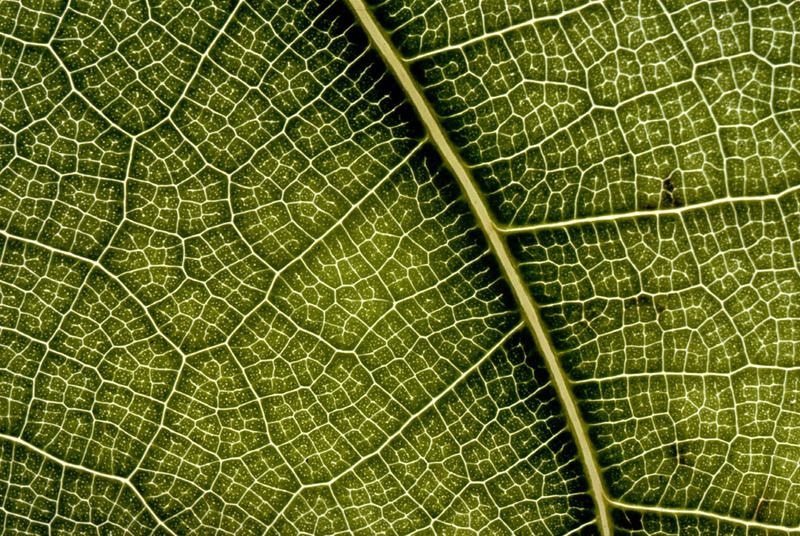 As the plant cells form, their corners collapse to form a triangulated structure. 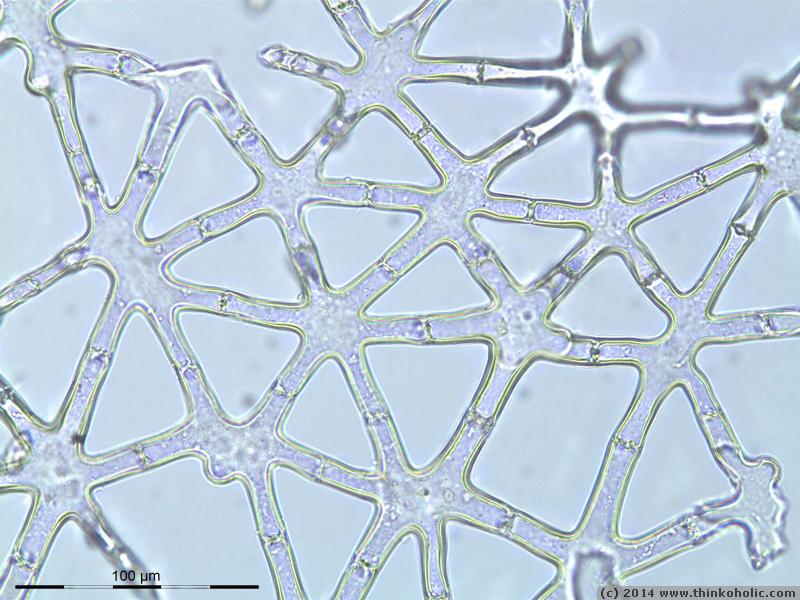 A magnified section of this structure is shown in the photomicrograph below. A single soap bubble is spherical. This is a state of least energy. A sphere contains the greatest volume with the least surface area. It is the most economical geometry to contain a single volumetric unit. This is called a minimal surface. However when bubbles cluster in groups something different happens. The bubbles pack together in such a way that all space is used up. 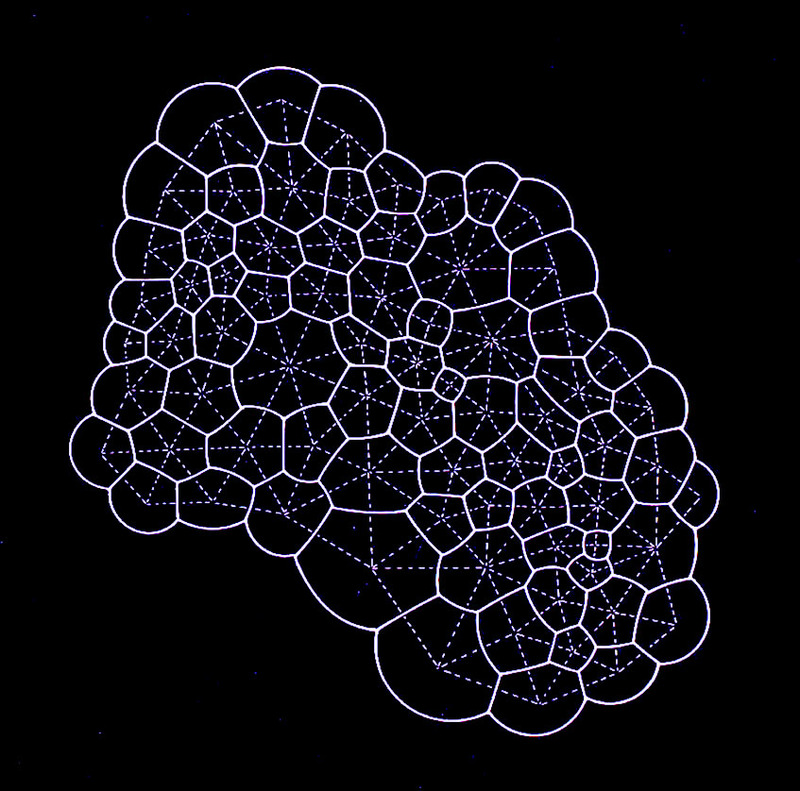 In so doing the bubbles become polyhedra, forming a froth of cells. These cells minimize surface to volume once again and comprise a structure of least energy. 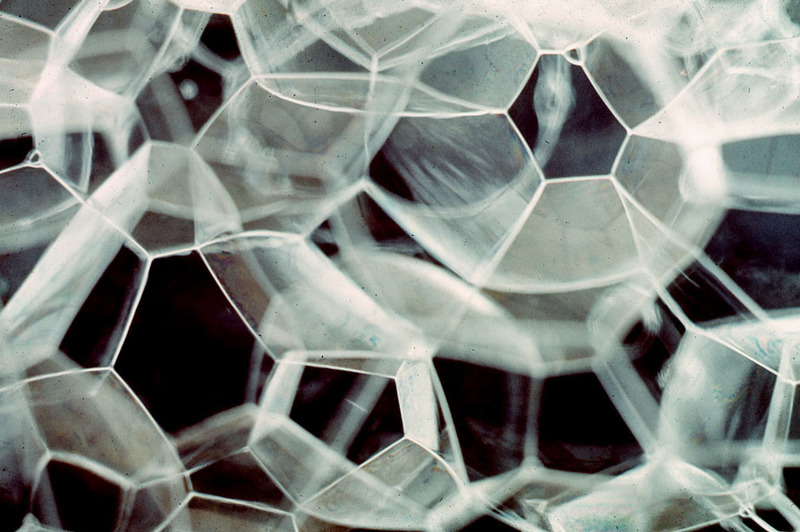 It is impossible to persuade the bubbles to take on an alternative configuration. What is remarkable, although not surprising, about soap bubble froths is their geometry. In the detail below can be seen surfaces, which are the polygonal partitions separating cell volumes, and the edges of these polygons. The lines are the intersections of adjacent partitions. The edges meet everywhere at the same angle as the bond angle of carbon in the diamond crystal, which is 109° 28’. Not only do the edges meet at the carbon bond angle, there are exactly 4 edges (spokes) meeting at each point in the soap bubble froth, without exception. Not surprisingly, the partitions meet everywhere at 120°, the face angle of the regular hexagon. A careful observer will notice that the surfaces are not perfectly flat and, as a consequence, the edges are not perfectly straight. Remarkably the measurements of the edges are taken at tangents of the arced edges at their points of intersection. The result is the angle of 109° 28’ is found at every tangent line where four edges meet. The measurements of the angles of intersection of the partitions are taken as tangent lines at cross-sections of the bubble froth surfaces. Of course because these angles of intersections are 120°, there will always be three partitions around each edge, again, without exception. 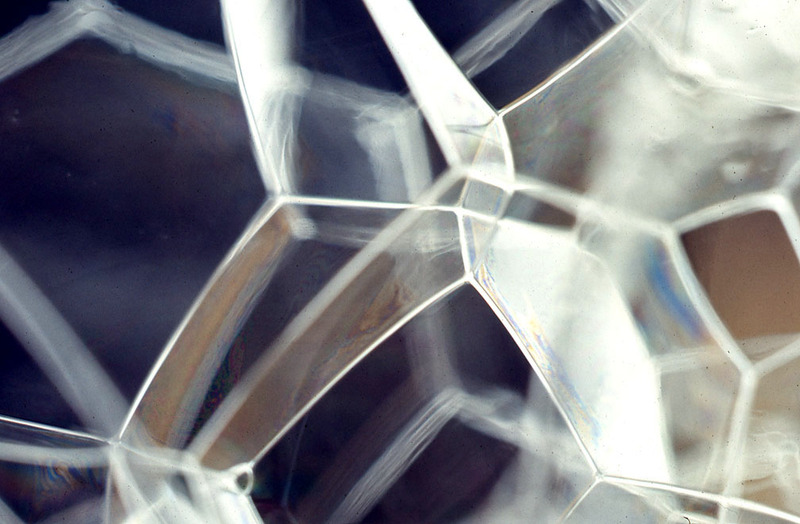 The soap bubble array, which can be seen with the naked eye, is the prototype for virtually all microscopic cellular structures found in nature. This would include plant cells, animal cells, and even cells in metal alloys. This is an x-ray microradiograph of aluminum tin alloy, magnified about 20 times actual size. 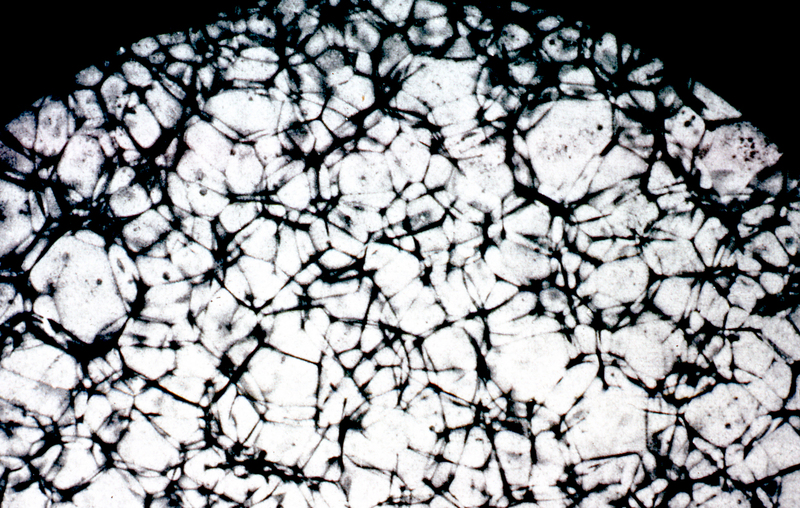 The dark areas reveal the boundaries of the cellular array. 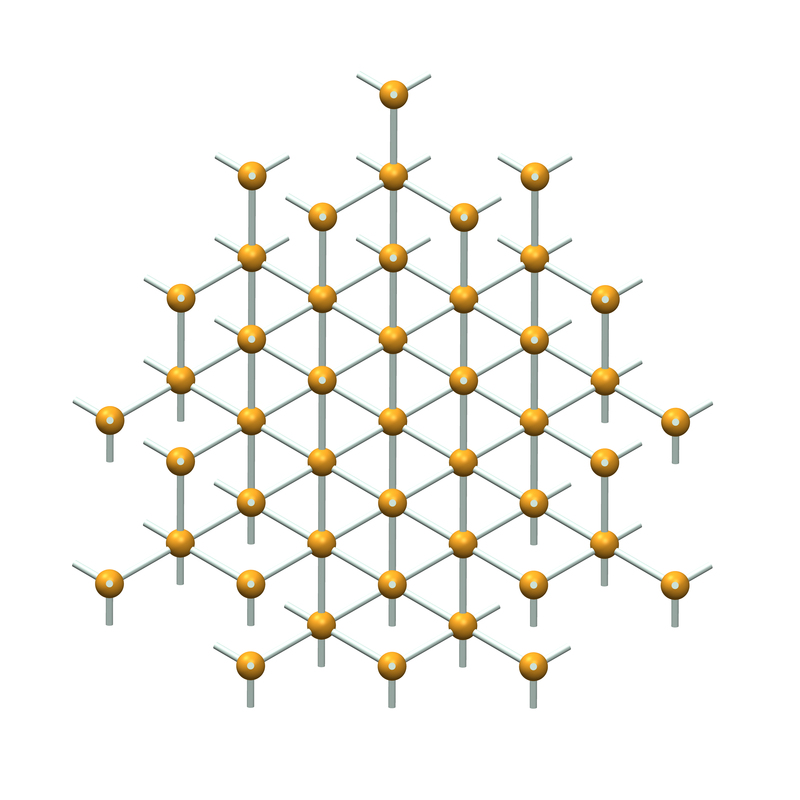 Each cell is a separate aluminum crystal (molecule) and the tin forms the partitions. There is no denying the similarity of the image to that of the soap bubble froth. We have seen that when you join the centers of neighboring regular hexagons a tiling pattern of equilateral triangles is the result. 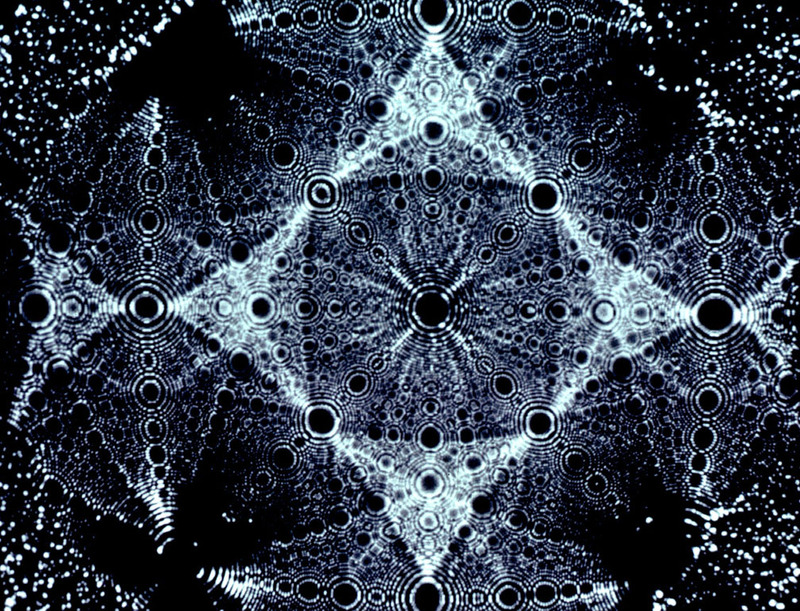 Similarly, when you join the centers of neighboring soap bubbles through their shared partitions, a three-dimensional triangulated structure is the result. This is illustrated below as a planar array of bubbles, which can be considered a cross-section of a three-dimensional array. It clearly shows the triangulation of the bubble array. The reason that the bubbles in a cluster differ in size is due to differences in their respective volumes, or in this case their areas. The 120° hexagonal tangent angles remain consistent throughout the pattern, and in three-dimensions the 109° 28’ tangent angle at the points (called vertices or singular is vertex) also remains constant throughout the bubble froth. In this pattern of three edges meeting everywhere at 120°, the average cell shape will be six sided, that is hexagonal. This is true even though the pattern includes polygons with four, five, six, seven, and eight sides. The essential pattern, on the flat plane, is the three lines or edges meeting at 120° angles. This pattern with variations occurs frequently in natural structure. Indeed, the pattern of three edges meeting at a point is the simplest geometry for subdividing or tiling the plane. There can be no tiling with less than three edges meeting at each point. 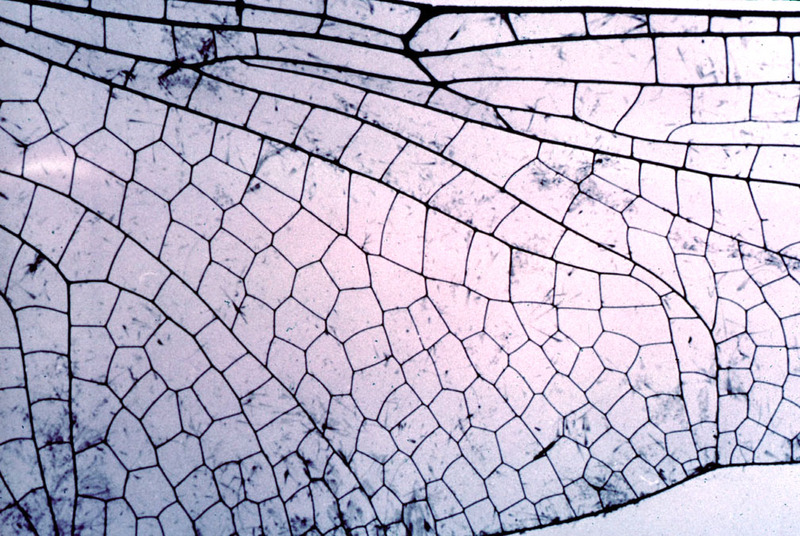 Below we have a dragonfly wing, with typical three-rayed intersections. 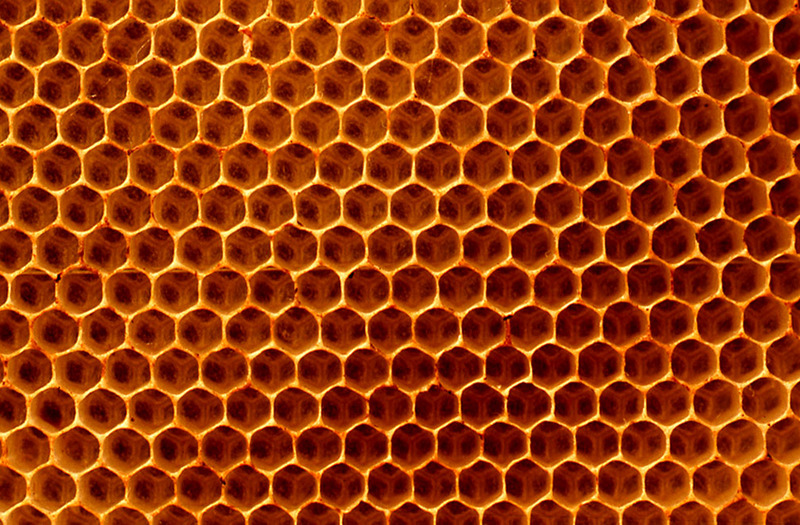 With such patterns the average cell shape will be six sided or hexagonal, although probably not a regular hexagon. 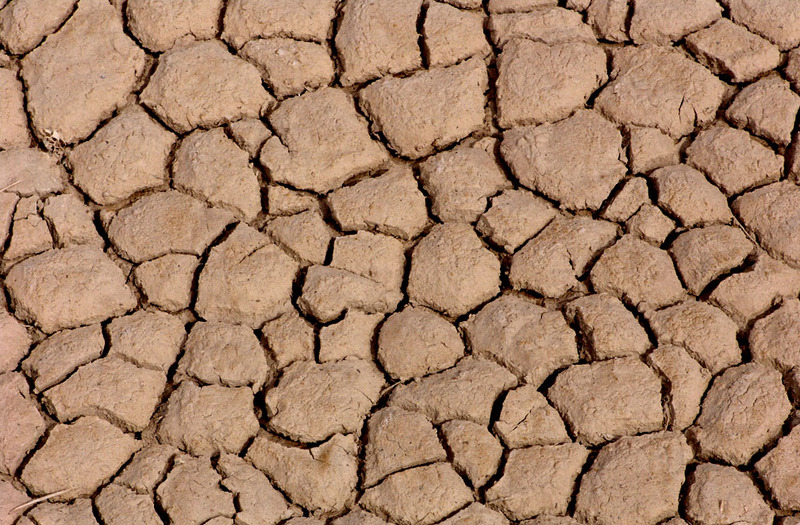 Cracked mud exhibits the characteristic three-rayed intersection as the simplest solution to the subdivision of the flat plane, the polygons again averaging six sides. The pattern of three-rayed intersections persists within the Philodendron leaf. 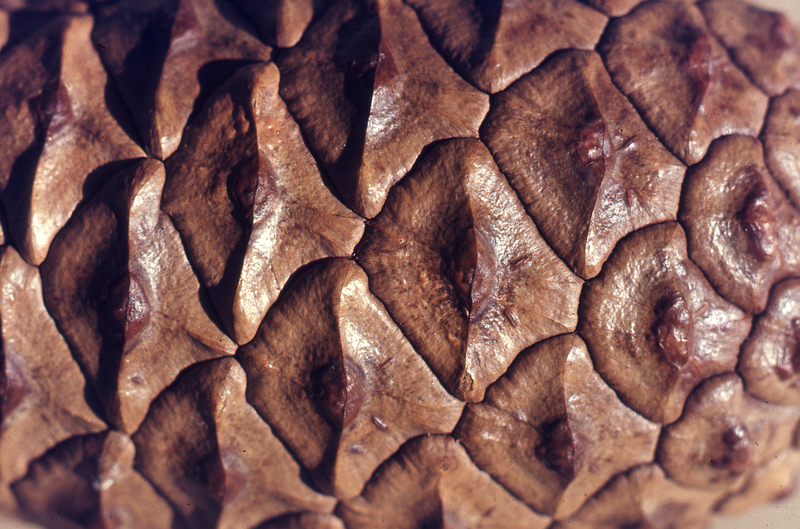 The pinecone exhibits a lovely hexagonal pattern at a stage of growth prior to opening up to its more familiar form as it dries out when going to seed. 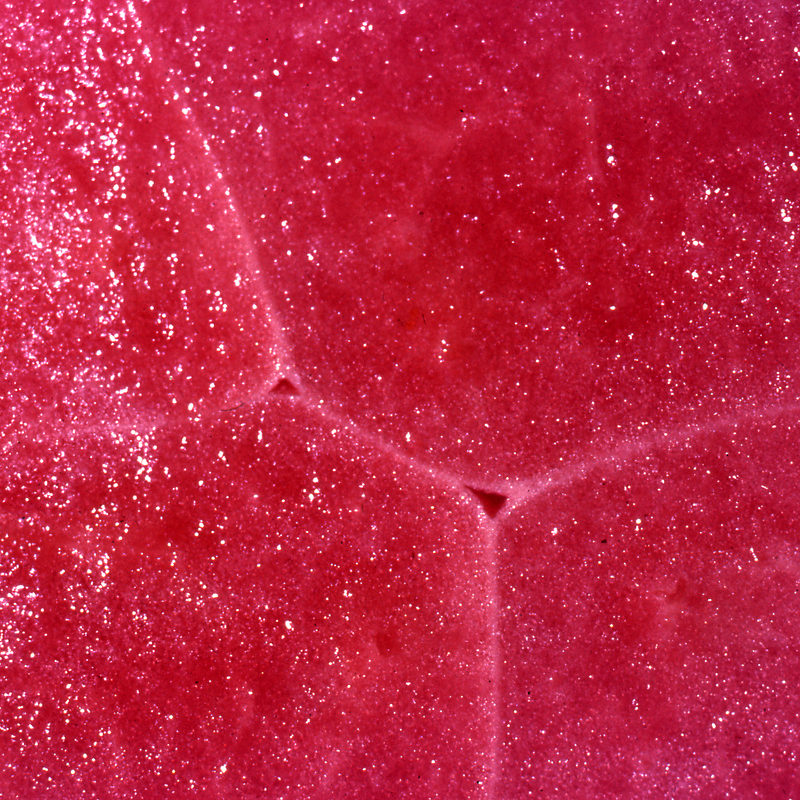 The watermelon close up reveals a pair of three-rayed intersections, tangents of which approximate the 120• angles of the regular hexagon. With the snow crystal, once again we see the regular hexagon. 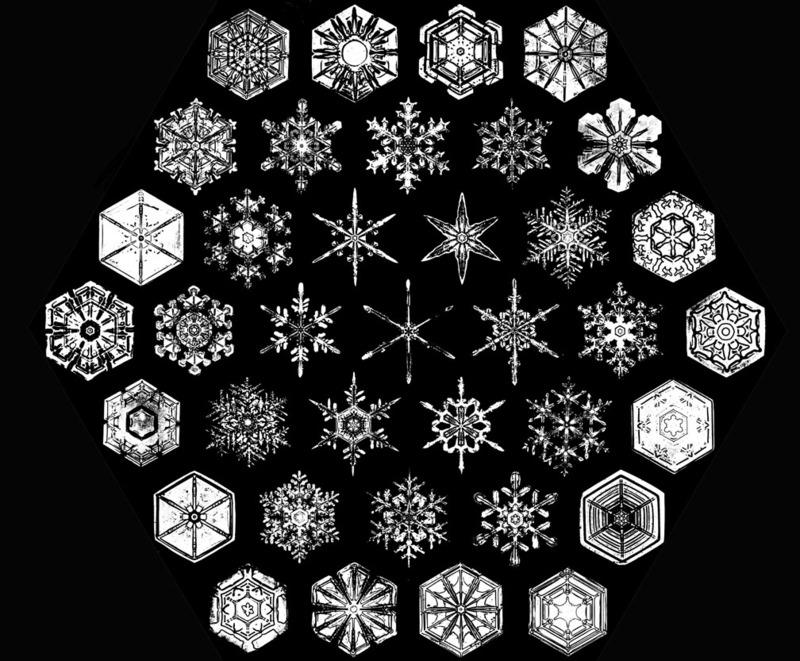 There are an infinite variety of snow crystal forms but all are hexagonal. The variation is a least-energy adaptation to environmental forces such as temperature, humidity, atmospheric pressure, and wind velocity. Since no snow crystals can form at the identical point in space at the same time, no two snow crystals are seen to be alike. 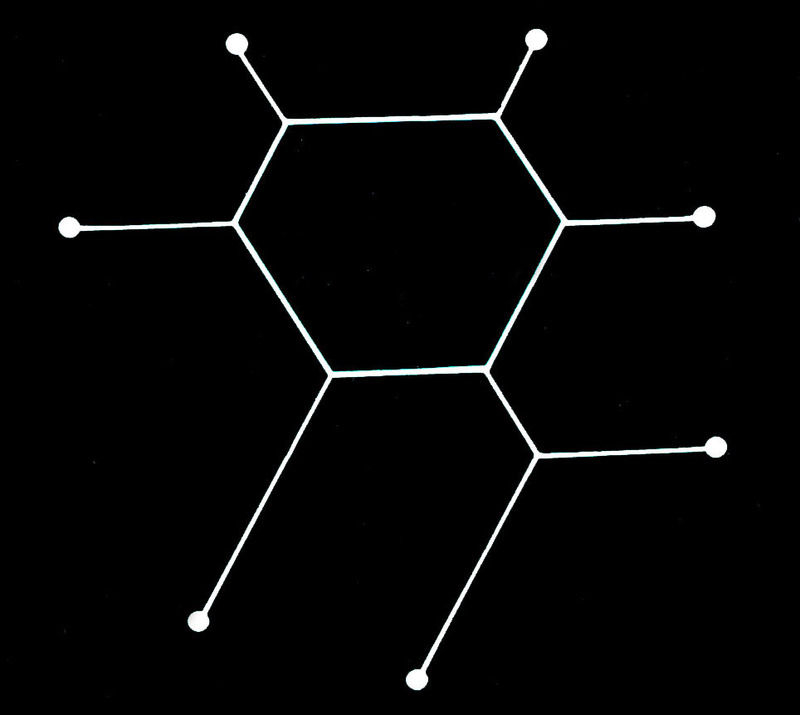 The fact that they are all hexagonal is determined by the geometry of their molecular structure, the water molecule, which is the building system of the snow crystal. And this building system is constrained by geometry, like all building systems – like all molecular structures. Here we see a field ion emission microscope image of platinum at about two million times enlarged. Each white spot is a single atom. The properties of the platinum atom dictate a particular dense geometry, which is revealed in this image. Again, we see that the material platinum is built from a kit-of-parts that embodies a specific geometric form. This geometry is very similar to the dense packing of atoms that characterize metal structures in general and accounts for the strength of metals. Geometry is pervasive in our world and profoundly impacts how the world works. Like the snow crystal, the platinum structure illustrates the fundamental characteristic of our world that all things are made from components parts. In the case of the snow crystals the component parts are atoms that comprise its molecule – the water molecule. And, of course, the diamond structure is assembled from carbon atoms, as expressed as the ball and spoke model, and our Curved Space Diamond labyrinth.